Consuelo Mack, Anchor and Executive Producer, Consuelo Mack WealthTrack. Most investors are well versed in the tenets of modern portfolio theory, but they lack a framework for dealing with stock, bond, and currency markets during periods of instability. Younger investors are even more disadvantaged because they only know the post-crisis environment in which interest rates have been set at zero. Nicholas P. Sargen has four decades of experience as an international economist and market strategist covering global markets for Morgan Guaranty Trust, Salomon Brothers Inc., Prudential Insurance, J.P. Morgan Private Bank and most recently as Chief Economist for Fort Washington Investment Advisors Inc., an affiliate for the Western & Southern Financial Group. 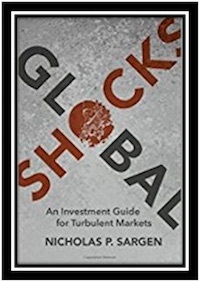 In his new book, GLOBAL SHOCKS: An Investment Guide for Turbulent Markets (Palgrave Macmillan, November 18, 2016), Sargen fills the void by providing the reader with a toolkit and guiding principles to manage money when markets are in turmoil. Written from a practitioner’s perspective, Sargen argues that investors who understand the common elements in crises have a better chance not only of surviving them but, ultimately of benefiting from them. GLOBAL SHOCKS details how a series of currency crisis that were prevalent in the 1970s and 1980s followed a predictable pattern in terms of movements in interest rates and exchange rates. However, this is not the case for asset bubbles that ensued. Therefore, GLOBAL SHOCKS is organized into two sections: Investment Challenges in a High Inflation Era and Easy Credit Breeds Asset Bubbles and Instability. Both sections are illustrated through a number of case studies (ten in all), beginning with the breakdown of the Bretton Woods fixed exchange rate system through the current situation in which investors are assessing whether China could become the next bubble. Each chapter discusses how the respective crisis or bubble unfolded at the time, the way policymakers and markets responded, and the optimal strategy for positioning portfolios. Sargen’s goal is to share these experiences and the lessons from them, so investors will be better prepared to recognize patterns and warning signs for future shocks. GLOBAL SHOCKS’ concluding chapter ties the episodes together and considers how the nature of financial crises has evolved since the collapse of Bretton Woods. “We cite factors that make it difficult for policymakers and investors to detect problems in advance of an asset bubble. The good news is investors get a second chance to outperform when markets are over-sold; however, they need to formulate a strategy to limit the damage during the sell-off phase and to capitalize on the eventual recovery,” argues Sargen.